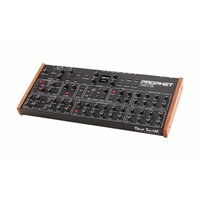 16-Voice Polyphonic Analogue Desktop Synthesizer. 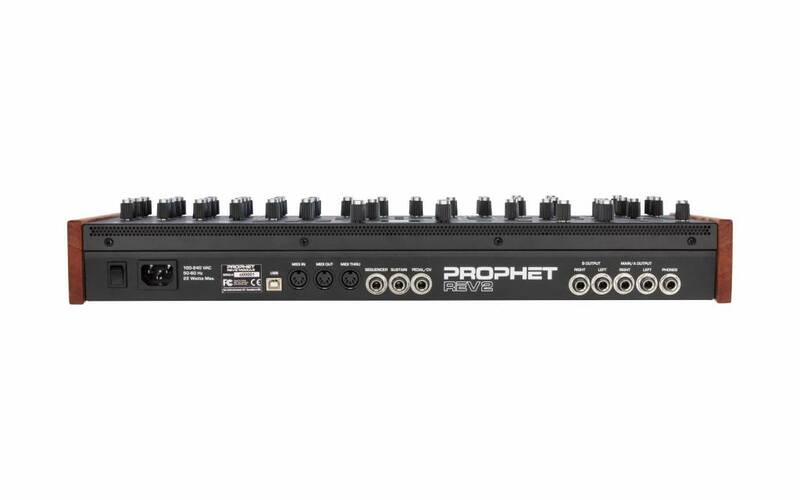 A Modern Classic Reinvented — The Prophet Rev2 desktop module is just as powerful and easy to use as its counterpart, the Prophet Rev2 keyboard. The module has the same controls with the same the same ease of use as the keyboard version. 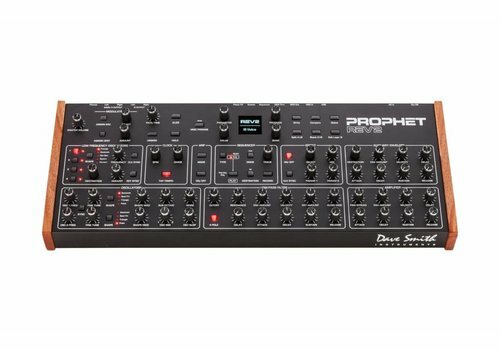 Best of all, it sounds just as awesome, because it’s exactly the same on the inside — Dave Smith’s reimagining of his now-classic Prophet ’08 poly synth. 16-Voice Polyphony — With 16 voices to play with, you have the freedom to allocate them as you wish. Play two-fisted chords via your MIDI controller, stack two 8-voice sounds for massive, complex textures, or split your controller into two completely separate 8-voice Prophet Rev2 instruments. 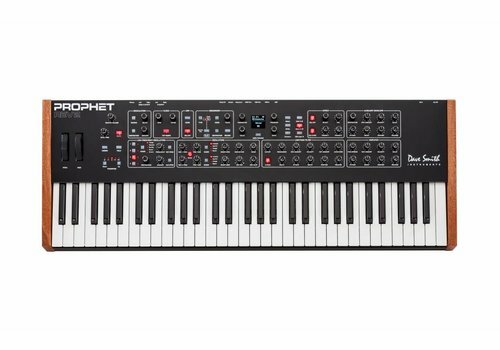 An 8-voice version of the desktop module is also available, which, like the Prophet Rev2 keyboard, can later be expanded to 16-voices with the Expander Kit if desired. 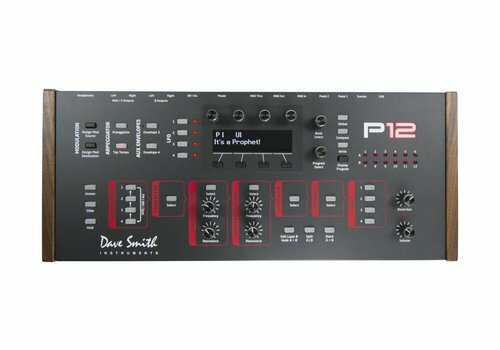 Bold Sound — The Prophet Rev2 gets its bold, punchy sound from its 2/4 pole, low-pass, resonant Curtis filters per voice. These are the same filters used not only in the Prophet ’08, but in many classic instruments of the 70’s and 80’s. A separate Audio Mod control adds additional harmonic complexity and movement. 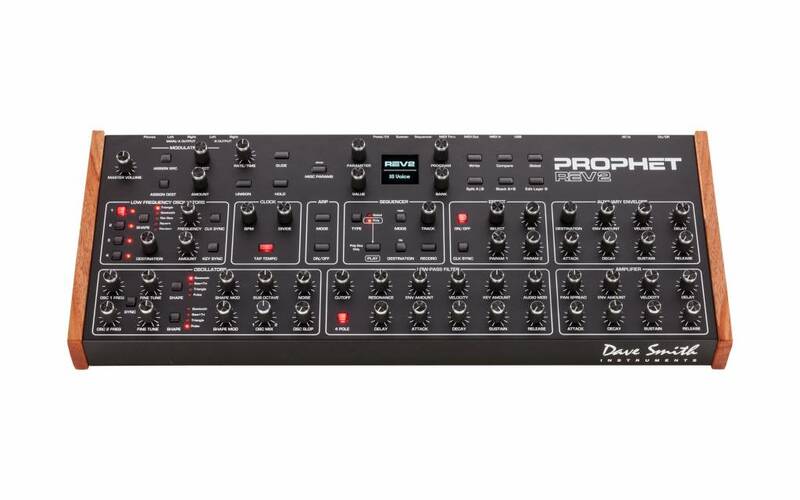 Waveshape Modulation — A powerful new feature unique to the Prophet Rev2 is waveshape modulation. You can now vary the “pulse width” of any of the four waveforms (sawtooth, saw+tri, triangle, square). Using the Shape Mod control, you can manually dial in a desired waveshape width or use an LFO or other mod source for continuously shifting timbre. 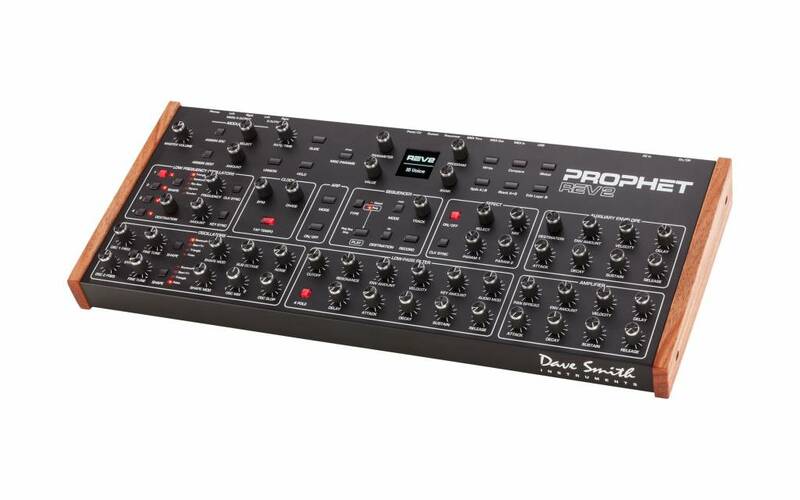 Even single-oscillator sounds take on new depth and dimension. The tonal possibilities are vast. Effects Per Layer — The effects section provides reverb, delays (standard and BBD), chorus, phase shifter, ring modulation, and distortion. In stacked or split voice mode, you can apply a different effect to each layer. Effects parameters can be modulated through the Mod Matrix. Extended Mod Matrix — Also present from its predecessor is an easy-to-assign Mod Matrix, now twice as big, with 8 individual slots and many more sources/destinations. It’s a veritable sound designer’s playground. Poly Step Sequencing — The polyphonic step sequencer allows up to 64 steps and up to 6 notes per step. You can create a different sequence for each layer when you are working in stacked or split voice mode, making it a powerful tool for composition or performance. 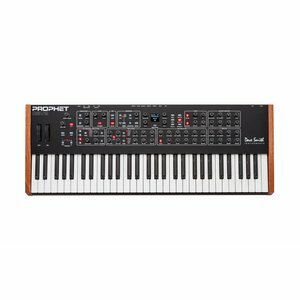 The sequencer also functions as a modulation source in gated mode, allowing you to create up to 4 different 16-step sequences for complex modulation. Sequences allow ties and rests, and can sync to an external MIDI clock. The arpeggiator features note repeats, re-latching, and can be synced to external MIDI clock, as well. 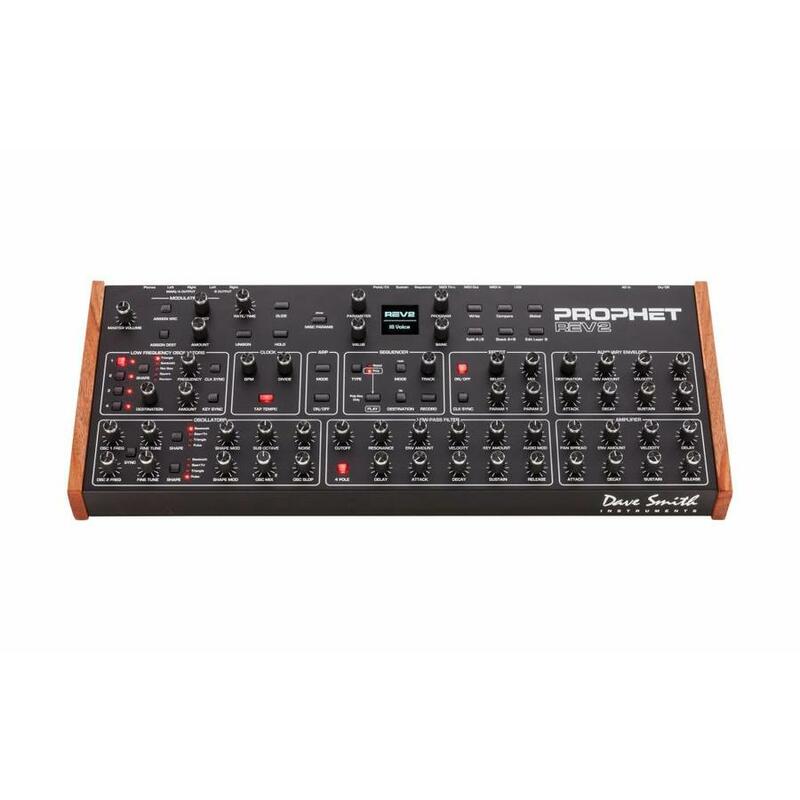 Per-Knob Programmability — The knob-per-function front panel offers instant access to Prophet Rev2 functions. Included are 512 permanent factory programs and 512 rewritable user programs. Eminently Playable — All of this polyphonic muscle is packed into a compact desktop module with an integrated power supply, USB support, and a crisp OLED display. Whether you’re gigging or recording, it’s an analog powerhouse like no other. ENVELOPES — 3 envelope generators: filter, VCA, and assignable (four-stage ADSR + delay); Envelope 3 can loop. SEQUENCER — Polyphonic step sequencer with up to 64 steps (6 notes per step), and ties and rests. Separate 16 x 4 gated step sequencer. Each layer can have a separate sequence. CONTROLS — 55 knobs and 35 buttons enable deep and comprehensive editing with little to no menu diving. 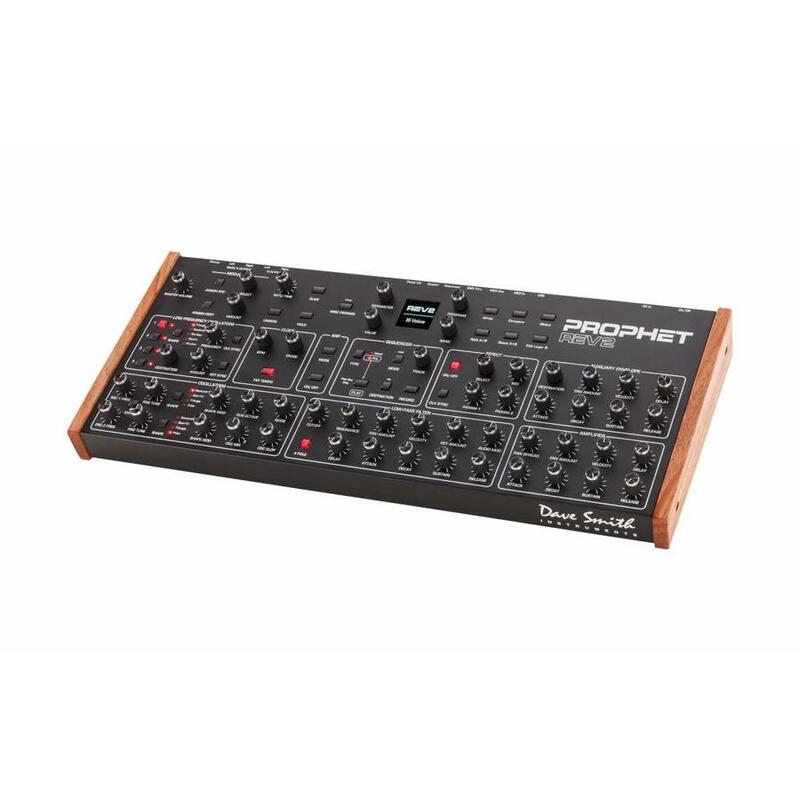 8-Voice Polyphonic Analogue Desktop Synthesizer. 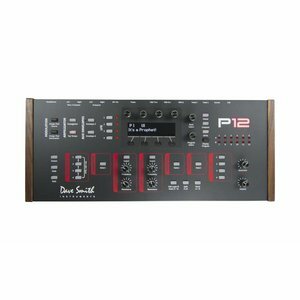 12-voice Hybrid Digital/Analog Synthesizer Module.